As part of my 2015 reading challenge, I am currently reading 1177BC: The Year Civilization Collapsed by Eric H Cline (and yes, as a Brit, writing “civilisation” with a Z physically hurts me). I’m not far thorugh yet but something that struck me in my reading so far is the reach of the networks between the cultures that existing in the centuries prior to the titular collapse. Rulers whose capital cities were hundreds, even over a thousand miles from one another were sending each other gifts of things like leather shoes. 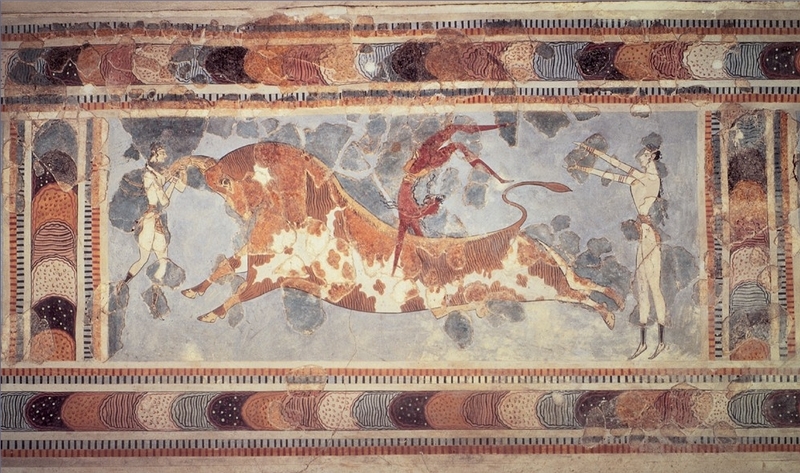 Craftspeople from the Minoan culture on Crete travelled to the major cities of cultures all around the Mediterranean and beyond to create fresco wall paintings because it was fashionable. “Knossos bull” by ArtStudy version 2.0 (Saskia Ltd, Thomson Wadsworth). Licensed under Public Domain via Wikimedia Commons. This was 3,500 years ago, before advanced shipbuilding techniques existed, before the road infrastructure of the Roman empire – or indeed the city of Rome itself – existed. It’s difficult not to think of them as primitive, because of how long ago this was and how different a world it was to what I am familiar with, but really it is still human culture. The people of this ancient time were no less ambitious, no less curious, no less vain than their descendants in classical Greece, with which I am more familiar, or the Roman Empire, or the Middle Ages or the Age of Exploration or indeed the modern day. They had different circumstances to deal with, sure, but every generation has different circumstances than their parents. It seems to me that when I am working on stories I often think in very constrained geographies and economies. I think of trade as happening between two neighbouring countries, maybe between two countries separated by one other country in between or by a small sea. I struggle to think of alliances and diplomacy and trade and the movement of skilled craftspeople over long distances between vastly different cultures. I manage to think “oh yes, this country exports this metal” but I don’t ever get to the point of thinking, “this particular region is the only known source of this metal, so it gets exported to everywhere”. Economy is something I need to work on. I tend to think in terms of what gets exported, what’s high quality, what needs to be imported, but I don’t think about the human level when I’m looking at economies. I don’t think about skilled craftspeople moving to where they think there are opportunities. I don’t think about rulers interacting with one another through the sending of gifts and envoys, or restricting the export of materials they don’t want their enemies getting their hands on. I don’t think of the different merchants through whose inventories individual items will pass on their way from one culture to another, and what those merchants have or haven’t seen of the cultures where these items originated or are destined for. It’s a whole new layer of complexity I have missed until now. A whole new area of human interactions that could provide me with stories to tell.